Here is the painting for today, Day 24 of the 30 in 30 challenge. At the moment the painting doesn't have a name. For some reason it eludes me today. 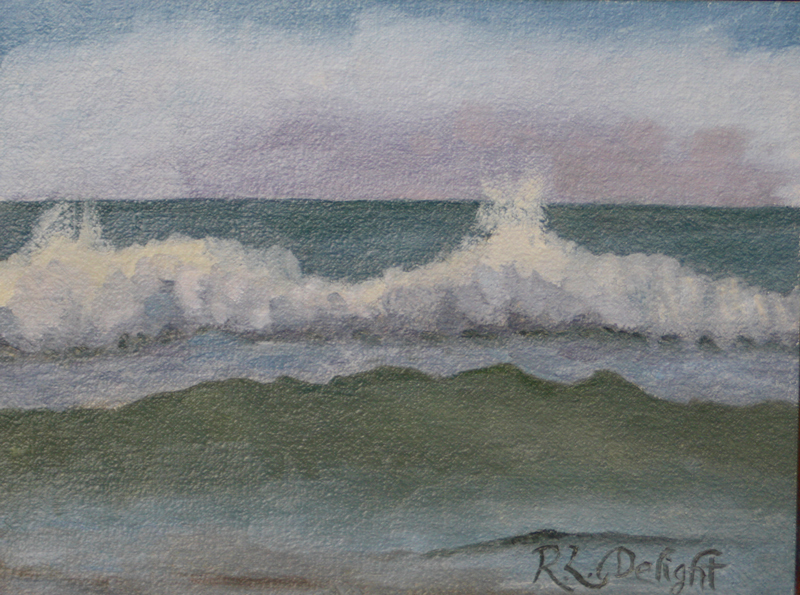 I repainted this from Wave study #24 which was my first attempt at a timed one-hour quick study. I changed a few things. I am still not happy with the swell in the foreground. I remember that this day had large clouds that would block the sun in certain spots. The waves were illuminated while the swell in the foreground is in cloud shadow. Another aspect to study further! I had hoped to get out today to paint but I had to spend time trying to find a fix for my plein air umbrella at the hardware store. No go so far. I could paint and hold an umbrella but that would make me rather unhappy. I might have to go further afield. As the challenge is winding down, I have been thinking of where I want to take this next. I have had a few thoughts but will be sharing them on the last day of the challenge. I am excited by the possibilities. I will be taking a better picture of this painting and putting it up for sale. This weekend I am hoping to get more work done on my website and blog to make it easier to buy a painting for anyone who is interested. I am rather tired today and my thinking is fuzzy so I am going to cut this post short. Until tomorrow then!